Vinaigrettes are often distinguished by the type of vinegar used in the dressing—balsamic vinaigrette, red wine vinaigrette, etc. But they can also be differentiated by the oil used, as well as its seasonings. In this Italian vinaigrette, for example, the main difference between it and the basic vinaigrette it closely resembles is that this recipe is made with olive oil rather than ordinary vegetable oil. And the fact that it includes oregano, parsley, and garlic, three quintessentially Italian ingredients, also contributes to its name. Place all the ingredients in a blender and mix for about 10 seconds or until fully combined. Transfer to a glass bowl and let stand for 30 minutes to let the flavors meld. Pour into a jar or bottle, cover tightly, and store in the refrigerator until ready to use. It is recommended that you use as good a quality of olive oil you can afford because you will taste the difference. A nice, fruity extra virgin olive oil will add great flavor to this dressing. Remember that once you've mixed the dressing, it's best to let it sit at room temperature for 30 minutes. You can ultimately store it in the fridge, but this initial melding time works best at room temperature, and your vinaigrette will be more flavorful. 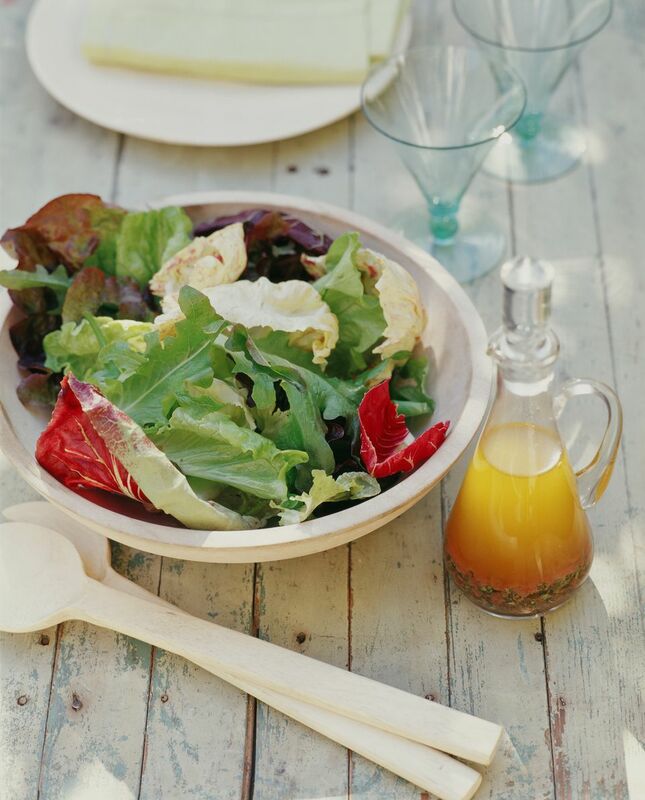 This fresh-tasting vinaigrette is not only meant for a green salad. Try it drizzled over grilled vegetables, or as the dressing for a pasta salad studded with sun-dried tomatoes and artichoke hearts. It can also be a delicious marinade for grilled chicken. Fresh herbs are preferred versus dried ones, but if you only have dried parsley, dried oregano, and dried garlic flakes, you can definitely use them. Just be mindful you will need to change the amounts of the herbs; dried herbs are much more potent than fresh, so for 1 tablespoon of fresh parsley, you would use 1 teaspoon dried, and if you're substituting dried oregano, use 1/2 teaspoon (the idea being that you need about three times as much fresh herb as dried). For the garlic flakes, however, you can still use 1/2 teaspoon. If you're substituting garlic granules, use 1/4 teaspoon, and for garlic powder, 1/8 teaspoon. The caveat here is that dried herbs lose their potency within about 6 months, so for best results, make sure your dried herbs are fresh. You can make your own freeze-dried herbs if you like, which is ideal if you have a bunch of parsley and can't possibly use the whole thing before it goes bad. Pull off the leaves and chop them up as finely as possible. Then pour onto a baking sheet lined with paper towels and let sit out overnight. Transfer the herbs to an airtight container (like a zip-top bag) and store it in the freezer. You can also freeze the parsley stems separately—they are great for flavoring homemade stocks.